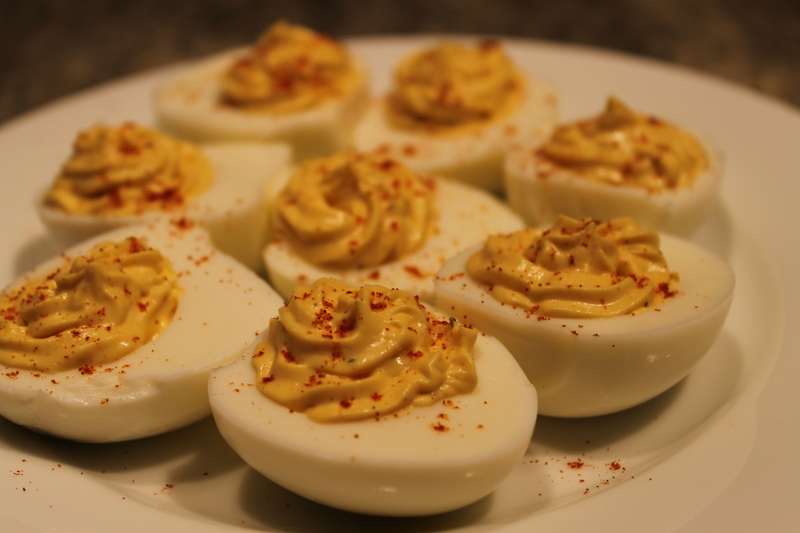 I just love a deviled egg, and what a perfect opportunity to showcase Dijon mustard in all of its glory. So let’s get to it. First you need to hard boil some eggs. You can do this well in advance. It is frankly astonishing how long they last in the refrigerator. 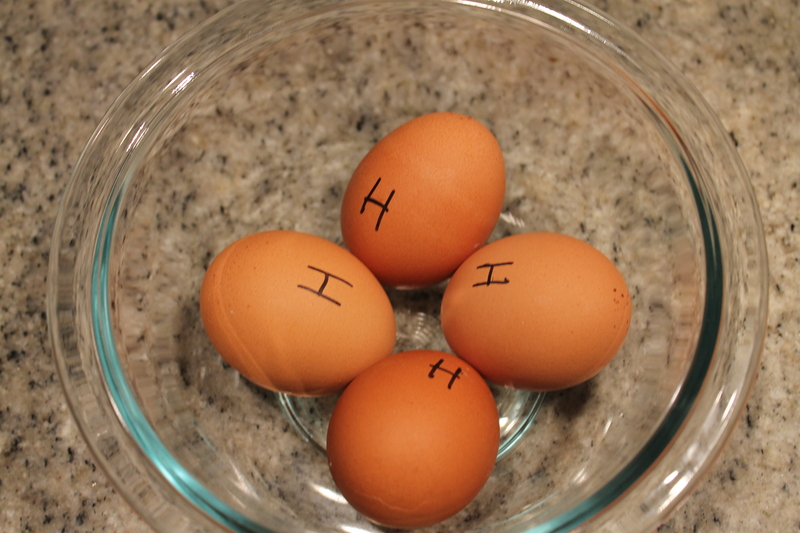 Hard boiling eggs is quite simple. It seems like everyone has their own technique, but the method that has always worked for me is: place desired amount of eggs in an appropriately-sized pot. Pour in enough water to generously cover all of the eggs. Turn the burner on high, bring the water to a boil, then turn off the burner, cover the pot and let the eggs sit for 10 minutes. Run them under cool water until you are able to handle them, then I’d recommend marking them with an H or HB or anything else before you pop them in the fridge as to avoid unfortunate situations with omelets vs. egg salad. When your eggs are adequately chilled (2+ hours makes them much easier to peel), gently crack the shells on a counter and peel them. 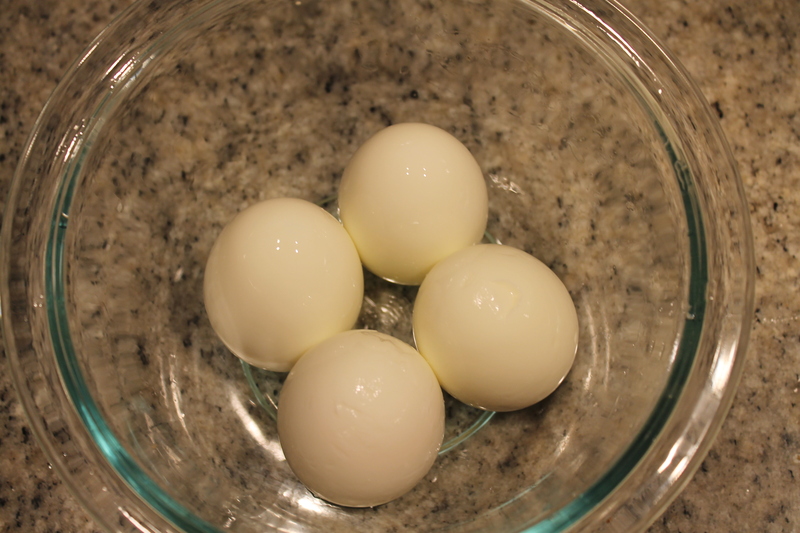 Slice them in half, and remove the yolks (sometimes using a small spoon helps here), place the yolks in a small bowl. Now for the additions that make these eggy treats so good, this is for 4 eggs, make as much or as little as you like, also, depending on your personal tastes use more or less of the below. Mix the mustard and mayo in with the egg yolks until it is as smooth as possible, then season with salt and pepper to taste. If you want to get a little fancy, you can use a piping bag to pipe the filling back into the eggs, or you can just use a couple of spoons. Sprinkle a little paprika on top and you are good to go! These are a perfect appetizer for any gathering, and you can really play with the flavors to customize them however you want — add bacon bits or dill… the list goes on. 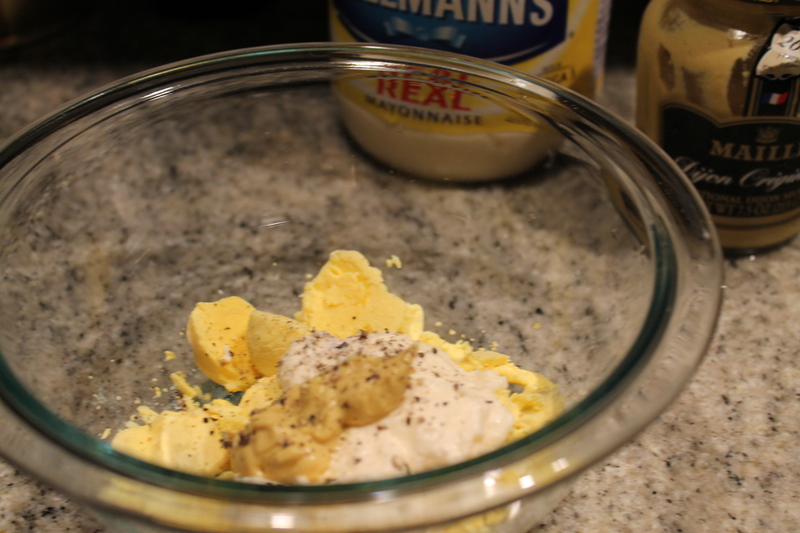 This entry was posted in Condiments, Eggs and tagged Deviled eggs, Dijon, hard boiled eggs, mayonnaise, mustard. Bookmark the permalink.